It may not be replaceable, but it’s certainly overshadowed by procrastination. Persistence has been a part of the natural experience since long before Sisyphus was punished to forever repeat rolling a boulder up a hill, only to have it always roll back down. 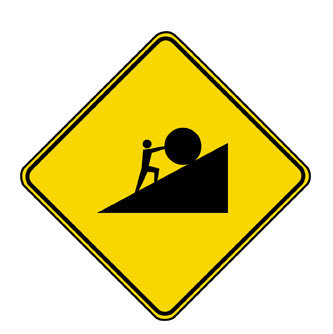 Sisyphus is from Greek mythology and he was the king of Ephyra and was punished for chronic deceitfulness. But not all persistence is as futile as the punishment of Sysiphus. Persistence is a great ally in accomplishing goals that are complex or take time. Blogging for example takes persistence. You can’t just post one article and call it a blog. You must persist through and continually post consistently in order to really get to an audience and get traffic and notoriety. Persistence is also about pushing through pain, for example, running a marathon takes persistence. As long as you have the will to keep putting one foot in front of the other you can cross the finish line and that goes for everything, not just running a marathon. But as I stated at the beginning, procrastination is the enemy of persistence. So get moving, your goals aren’t going to accomplish themselves.